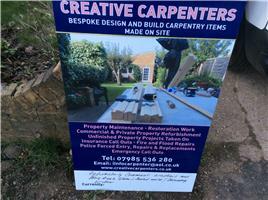 Creative Carpenters - Carpenter, Fascia/Soffits/Guttering, Windows/Doors/Conservatories based in Harrow, Middlesex. We would like to Welcome you to the CREATIVE CARPENTER site. We are a committed team of tradesmen with a wealth of experience stemming over a period of 40 years in total. As a combination of Carpenters and Cabinet, makers we can deliver simple bespoke fitted requirements to large refined bespoke property refurbishments. It makes no difference whether you would like a House, Shop or Commercial property refurbished. We can do it all. After all "Who knows what's required in property improvements, more than the Carpenter". Over the 40 year duration in the construction industry our contribution to property has included. Specialised work such as working with fine details on large sized scaled projects i.e. 6 Million pounds for clients of high profile. We are therefore familiar with delivering quality works to high standard. Our skills input sometimes stems to specialist items actually being made on site. We aim to cut out the long process of waiting endlessly with excuses after excuses. Which some clients may have experienced , with other companies who claim that the item/s being ordered would take several weeks to arrive. We have aim to make a difference, by cutting out the delayed process. In doing so we make items there and then on site. For the benefit of providing a speedily and overwhelming service to our clients. We aim to continue to be at the top of the listings on Checkatrade , we want to remain being the priority company everyone turns in times of need. As well as our aim to continue to grow rapidly and to develop a raptor for repetitive business with our valid clientele.